Aztecali has a small menu, but the home-style Cal-Mexican cooking is big on heart. Clockwise from top: Carnitas, barbacoa, and chicken tinga. Hours: Tue.–Fri. 10:30 a.m.–8 p.m., Sat.–Sun. 10:30 a.m.–4 p.m.
At first, Aztecali wasn't going to serve burritos. Co-owner Juana Ojeda, who hails from the southwestern Mexican state of Guerrero, didn't grow up eating the foil-wrapped bundles, and, strictly speaking, didn't consider them a traditional Mexican food. 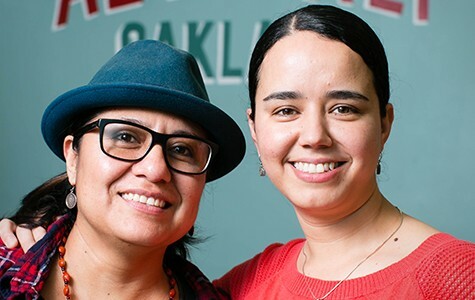 So when Ojeda and her business partner (and girlfriend) Claudia Mercado opened their pint-sized Oakland taqueria, burritos weren't part of the plan — that is, until customers kept asking for them. The holdout didn't last long, but even when Ojeda added burritos to the menu, they were her own idiosyncratic version. 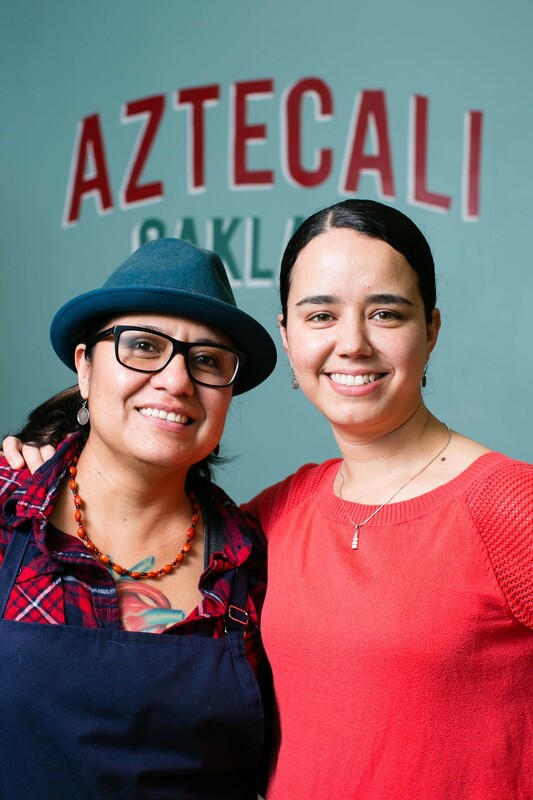 In that respect — and several others — Aztecali stands out from the dozens upon dozens of taquerias in Oakland. Meanwhile, Ojeda, who does the cooking, said that Aztecali is the culmination of about twenty years that she has spent working at Mexican restaurants in the Bay Area — most recently as sous chef at Cala, the high-profile US debut for Mexico City chef Gabriela Cámara. As the restaurant's name suggests, the food is a mash-up of the "Aztec" and the "Cali" — a combination of Ojeda's Guerrero roots and the California ingredients and flavors that she has embraced since moving to the Bay Area in 1995. Of course, the East Bay has no shortage of Cal-Mexican eateries, with their Chez Panisse pedigrees, immaculate farmers' market produce, and higher-priced versions of traditional Mexican dishes. (In spirit and quality, the restaurant's closest analog is probably Cosecha, the Cal-Mexican powerhouse that has spearheaded the revival of Old Oakland's Swan's Market food hall.) But I have found few examples of the genre as unpretentious as Aztecali. Yes, the tortas are served on Acme deli rolls instead of traditional telera rolls. Yes, you can order Highwire cold-brew coffee that's mixed with Ojeda's house-made horchata — a refreshing, just-sweet-enough version, in case you were wondering. In the end, it was the homey simplicity of Ojeda's cooking that won me over. 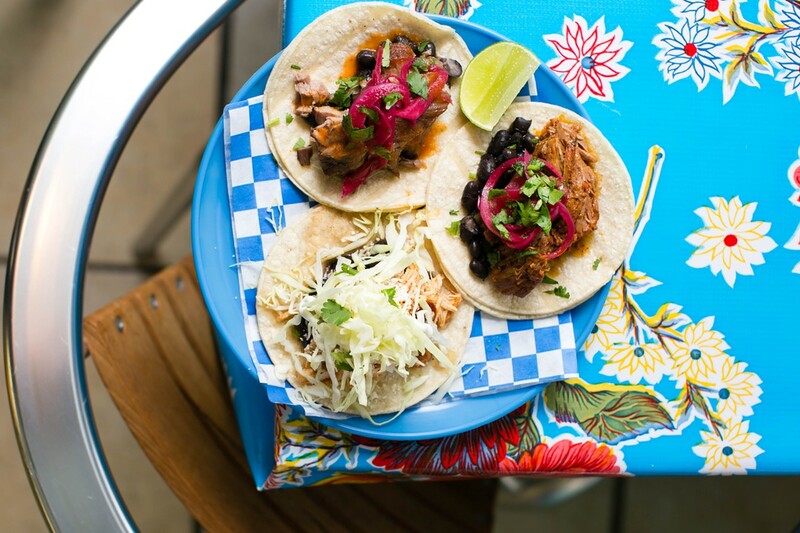 Unlike your typical taqueria, where grilled meats such as carne asada and al pastor are the main attraction, the focal point of Aztecali's concise menu is a selection of guisados, or stews. (Part of this is sheer logistics: Ojeda doesn't have room for a grill.) For now, there are three main options, served on the vessel of your choice: taco, burrito, or torta. My favorite of the guisados, by a large margin, was the chicken tinga: gently poached chicken breast — as tender as you can imagine — shredded and tossed in a chipotle sauce whose smoky heat was incredibly addictive. The tinga was delicious on a taco, topped with crunchy raw cabbage, a scattering of Cotija cheese, and a garlicky tomatillo salsa. But it was even better on the torta, which was one of the best chicken sandwiches I've had recently. The flavors were layered brilliantly — mashed avocado, like any good Cal-cuisine cook knows to spread on thick toast, and a little smear of mayonnaise and uncommonly moist refried bean. I especially loved how the tinga sauce soaked into the bread, creating an appealing contrast of sog and crunch. The two other guisados were also enjoyable. The carnitas consisted of pork shoulder that had been braised in citrus and beer. This is the kind of carnitas that's served as a soupy, slow-cooked stew — not the stringy, fried pork bits you'll find at the typical taco truck. Meanwhile, the braised beef barbacoa owed its delicate flavor to Ojeda's use of avocado leaves, a hard-to-find herb. Again, the meat was served shredded, but as tender as the chuck steak had become after several hours of low-and-slow cooking, I found it somewhat bland — a bit too delicate. Ask for an extra helping of that green tomatillo salsa, which Ojeda said is the traditional accompaniment to barbacoa in Guerrero. Indeed, if you are the kind of Mexican food devotee who has found "California-fied" versions of these traditional dishes to be to be too bland and watered-down in the past, both of Ojeda's house-made salsas — the bright, garlicky salsa verde and a red salsa, which comes in a squeeze bottle and is meant to complement the carnitas — offer some proof that Aztecali isn't afraid of big, bold flavors. Same goes for the chilaquiles rojos, offered as a brunch special on the weekend. For that dish, tortilla chips were topped with crema and a fried egg, but what was most notable was the fiery red chilaquile sauce. My only criticism was that the dish was a little bit too spicy for me to eat quickly enough to keep the chips from getting soggy. Other highlights: A chicken tinga tostada piled high with fresh ingredients — cubes of ripe avocado, thin radish rounds, and salsa verde. A vegetarian tostada, whose main ingredient was basically mashed potato, was just as good. As for Aztecali's aforementioned burrito, which Ojeda said is now her number-one seller, I was of two minds. On the one hand, I've been known to rail against burritos stuffed with too much rice and beans — empty filler, in my view. The barbacoa burrito I ate at Aztecali was packed with about as much rice as I recall ever seeing in a burrito, constituting more than half of the filling. Then again, the rice was delicious — perhaps the fluffiest and most delicate I've encountered at a Mexican restaurant in the East Bay. The secret, Ojeda said, is to use jasmine rice and to sauté it in rice bran oil with onions and garlic before cooking. The rice is what will make me order one of those burritos again, and it makes a side order of rice and beans — the simplest, and most inexpensive of indulgences — worth a trip to Aztecali on its own. If you are very lucky, though, you will have timed your visit for a day when Aztecali is serving its chicken pozole verde — just on the third Sunday of each month, for now. Ojeda's version of the famed hominy stew takes more than ten hours to make, in a process that starts with whole chickens cooked until they've given up all their flavor to the broth. A bright mole verde (a purée of fresh chilis, pumpkin seeds, tomatillos, and herbs) — a dish that actually originated in Guerrero — supplies the rest of the flavor. I appreciated the freshness and crunch of the accompanying tostada shells (sourced from Oakland-based La Finca, though Ojeda eventually plans to make her tortillas from scratch). And Aztecali is surely one of just a small number of restaurants in Oakland that nixtamalizes (i.e., soaks in limewater) its own corn for its pozole in-house — a plump, purple-tinged variety that resembles little chunks of ham in the bowl. The dish is in the running for best pozole in Oakland and is one of a handful of dishes at the restaurant that's wholly traditional. No California fusion here — just soulful food prepared just as Ojeda's mother or grandmother would have done in Guerrero.